I'm wondering if we can pose a question to AOA readers, is there anywhere in the Capital Region that sells freshly made tortillas? A variant of this question came up years ago, with only a few suggestions beyond "make 'em yourself." And, of course, things change. A lot of big cities around the United States now have a factory (or multiple factories) that produce tortillas and distribute them locally. As far we know, the Capital Region does not currently have a such place. But we can hope -- because good tortillas are a great thing. So, got a suggestion for Christine? Please share! My wife purchased pre-packaged, uncooked corn tortillas at the Albany Shop Rite the other day. You cook them at home in a skillet. We had them last night. They were OK - not great. A few years ago, the Westgate Price Chopper sold freshly made tortillas. If you timed it right you could get them still warm. I think they stopped. Haven't seen them in a while. These aren't locally made but I cannot recommend Tortillaland Tortillas highly enough. Like, they should pay me for how much I talk about these tortillas. They are raw and vacuum sealed, you heat them up for about 10 seconds each side, and they puff up into delicious, hot, tortillas with an unbelievably convincing homemade taste. It converted my picky family into corn tortilla lovers--they had only ever had preservative laden junk at home. I second the recommendation of the TortillaLand raw tortillas. My entire family loves them. The best place in Albany to get them is the Price Chopper in Slingerlands. I think the Walmart by the mall also carries them. THIRDED on the Tortilla Land. I checked the package last night and indeed the tortillas I mentioned in my comment above purchased at Shop Rite are Tortilla Land brand. Tortillaland lovers, are these truly "raw' tortillas in the sense that the dough is formed but not yet baked? I am wondering how they stay together in the package. Is it possible they are baked, cooled and packaged for you to reheat at home? Burnt My Fingers and others--as far as I can tell with my own senses and via the website, they are truly uncooked. They are sold in the refrigerated section, vacuum sealed, and the package says best used within 7 days or something like that. Price Chopper often has them on sale for a bogo or 2 for $5. 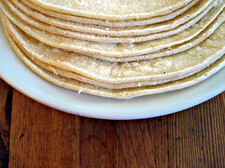 The corn tortillas are easier to separate--we tried flour for the first time recently and although they were delicious the were very sticky and a few tore as we were separating them. La Mexicana market in Schenectady has some very good tortillas for sale. At least one brand was familiar to me as one of the ones I used to buy still warm in Chicago. So it's not local, but still very good. It's not convenient if you don't live nearby, but I just stocked my freezer with them.